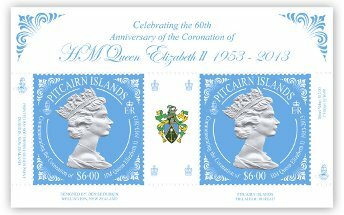 In 2013 HM Queen Elizabeth II celebrates the sixtieth anniversary of her Coronation which took place on 2 June 1953. For the last 900 years, the ceremony, which has remained essentially the same, has taken place at Westminster Abbey, London. The service was conducted by the Archbishop of Canterbury, whose task this has almost always been since the Norman Conquest in 1066. Present were representatives of the Houses of Parliament, Church and State. Prime ministers and leading citizens from the Commonwealth and representatives of other countries also attended. Elizabeth II was crowned Queen of the United Kingdom, Canada, Australia, New Zealand, South Africa, Ceylon and Pakistan, as well as taking on the role of Head of the Commonwealth. Elizabeth, then aged 26, had ascended the throne upon the death of her father, King George VI, on 6 February 1952. The coronation was held more than a year after the accession. The coronation is an occasion for pageantry and celebration, but it is also a solemn religious ceremony. During the ceremony, the Sovereign takes the coronation oath to uphold the laws of her Nations and to govern the Church of England. The Anniversary is being celebrated during 2013. 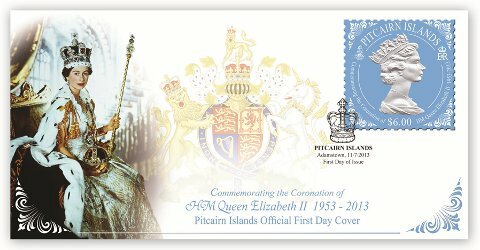 This stamp issue is released on July 11 2013 to coincide with the Coronation Festival which will celebrate the 60th Anniversary over four days in the gardens at Buckingham Palace and involve Royal Warrant Holders and Coronation Galas. 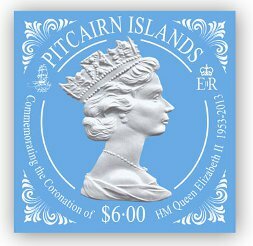 All standing orders for the Coronation issue will be filled from the Philatelic Bureau with the forthcoming Royal Baby issue, unless requested otherwise. Acknowledgement: First Day Cover image © Victoria and Albert Museum, London.